THE VETTE NET is a nationwide Corvette brokerage network and proud Lifetime Business Member of the National Corvette Museum. 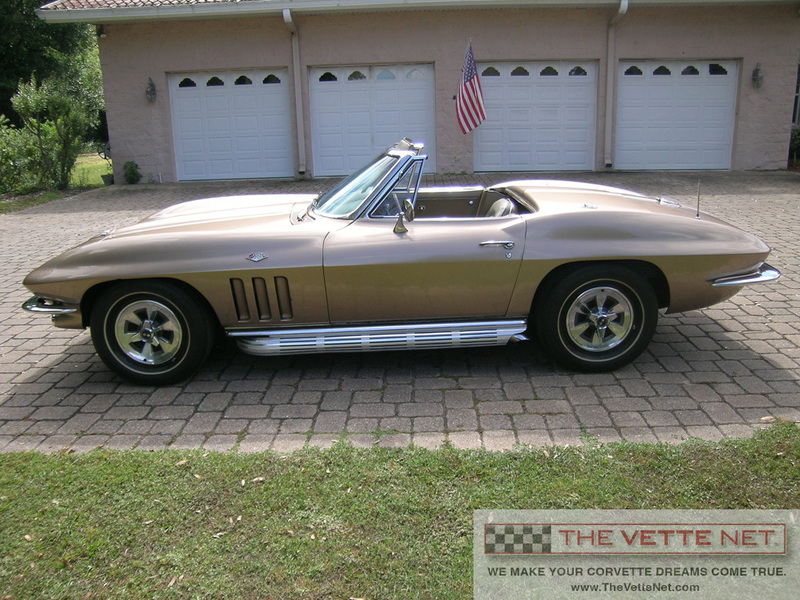 Thanks for stopping by to look at this beautiful Light Bronze Metallic Corvette convertible. It is located in central FLORIDA. I strongly encourage you to completely read this listing and review the photos of this rare Sting Ray convertible. It is very special. The current owner of this beautiful Corvette convertible has taken very good care of this classic Sting Ray. Yes, it has a color change but it is very well done. The owner reports the Light Bronze Metallic paint with saddle interior is in nice condition. In fact, the cosmetic condition of the entire Corvette is quite nice. Mechanically speaking the Corvette runs strong and you will have great fun shifting the 4-speed. Put the top down and start smiling as you listen to the unmistakable sound of the iconic Corvette side exhaust. Did I mention this 1965 Corvette is numbers matching? The engine pad shows the VIN and the assembly date of F0323HJ. If you check the suffix “HJ”, you will see it translates to 300hp with manual transmission and factory air conditioning. That is correct. This awesome Sting Ray is a factory air convertible. A very rare option especially in a 1965 convertible with a Muncie 4-speed AND full power options. You will not find many Corvettes like this one for sale. Especially with some documentation and factory air and all these power options: power windows, power steering, power brakes, and power antenna. PLUS you will notice it has the Teak Wood steering wheel. This is truly a rare Sting Ray. The odometer reads only 49,551 miles when recently photographed and is believed to be correct. The owner says the wear on the pedals and some of the documentation leads him to that conclusion. A collection of service receipts and other documentation comes with the Vette. You will also get the Protect-O-Plate and the Owner's Manual and owners’ history. The owner states the frame is solid with no significant oxidation issues. Actually, the frame appears to have been undercoated when new. The body appears to have factory original panels according to the owner. The chrome and stainless trim are also very nice, as you will see. No matter where you live, delivery can be arranged anywhere worldwide at a reasonable cost. I am very experienced working with international Corvette enthusiasts and welcome all inquiries. Inspection of this Corvette by a qualified specialist can also be arranged at reasonable cost. In business since 1998, THE VETTE NET (on the internet at www.TheVetteNet.com) has established itself as the premier resource for assisting Corvette buyers and sellers. We have completed thousands of transactions worldwide and we are very proud of our reputation for integrity and excellent customer service. We are fellow Corvette Club members. We drive Vettes. We live the life-style and enjoy the hobby. Our motto is under commit and over deliver and we guarantee a pleasant and straightforward experience.